Several reports and statistics are confirming positive effects of UAE’s firm stance on growth of non-oil private sector. UAE has taken several steps to bolster this area in order to minimize its reliance on oil sector, especially after oil crisis 2014. For this purpose, UAE is trying to provide incentives and facilities to several other sectors including business, education, media, SMEs etc. 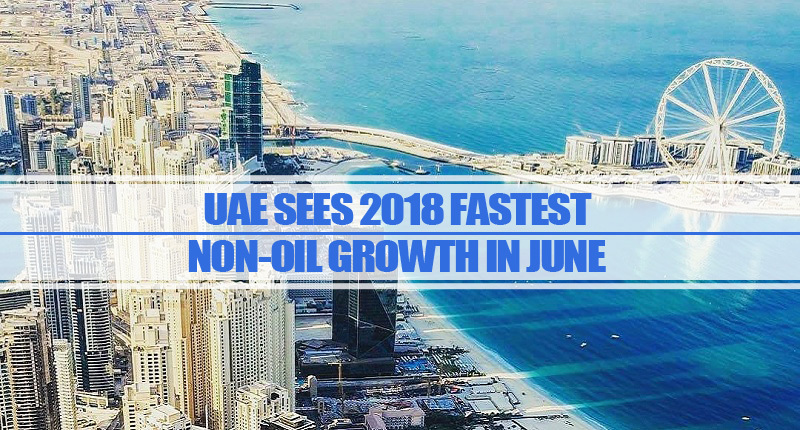 The latest report by Emirates NBD (famous banking group in Middle East) has confirmed that non-oil sector of UAE is growing continuously as the expansion of this sector was strongest in June 2018 as compared to previous months of the same year. Apart from the strongest growth year-to-date, output growth was also highest since past 7 years. This report also tells that output has been on rise since February 2010 and the recent rise was sharpest. According to details, higher business activity is the direct result of this growth as it increased inflow of new work. This strong growth in June was also positively affected by other important factors including promotional activity, business investment and high client demand from local and foreign markets. A really important factor behind this growth was the extraordinary business confidence among the business community. This spike in confidence resulted in business investment, economic upturn and new market initiatives. Another healthy indicator was the increase of buildup of work with exceptional pace in the same month. This growth is directly responsible for creation of new job opportunities along with improving situation for those starting a new business. According to head of MENA research at Emirates NBD, Khatija Haque, the headline PMI (Purchasing Managers’ Indexes) achieved its highest in June for year 2018. This is a clear indication of sharp increase in domestic new orders and productivity along with same effect on exports achieved by UAE non-oil private sector. This recent report by a formidable banking institute clearly highlights the growth of non-oil private sector in UAE. The most encouraging aspect is that this sector is growing continuously since past several years, especially after the adoption of new economic policy by UAE. Without any doubt, it is the best time for foreign entrepreneurs of non-oil sector to start their business ventures in this business friendly country.